This poster run happened in about mid February and I had the able assistance of Brian Howard who is the editor of the Philadelphia Citypaper. Brian is a fan of New Zealand music and we had made contact because of this. He had seen ‘The Clean’ play in Philadelphia and was immediately impressed. We all are fans of ‘The Clean’ and will forever be. Brian had also highly rated the Chris Knox ‘Stroke’ album in the newspaper and this gladdened my heart. He cited that album as being one of 2009’s best. We can’t be fairer than that. The Northern Liberties/Fishtown area of Philadelphia is more than two hundred years old and is nicely worn in (“There’s a crack in everything and that’s how the light gets in” – Leonard Cohen). It’s an area of good music venues and people doing unusual and thought-provoking things. I guess you’d be considered a nutcase if you did some of these things in New Zealand, but many of them relate to art and that’s a valuable exercise in itself. Art (and poetry) is often about challenging ‘norms.’ If no-one pushed the status quo and if society was nicely tied, tidied up, managed and orderly, then I think we’d all die of some kind of heartbreak. Change and movement are what life is about. There is a road ahead. Poetry shows this road clearly. Music does as well. 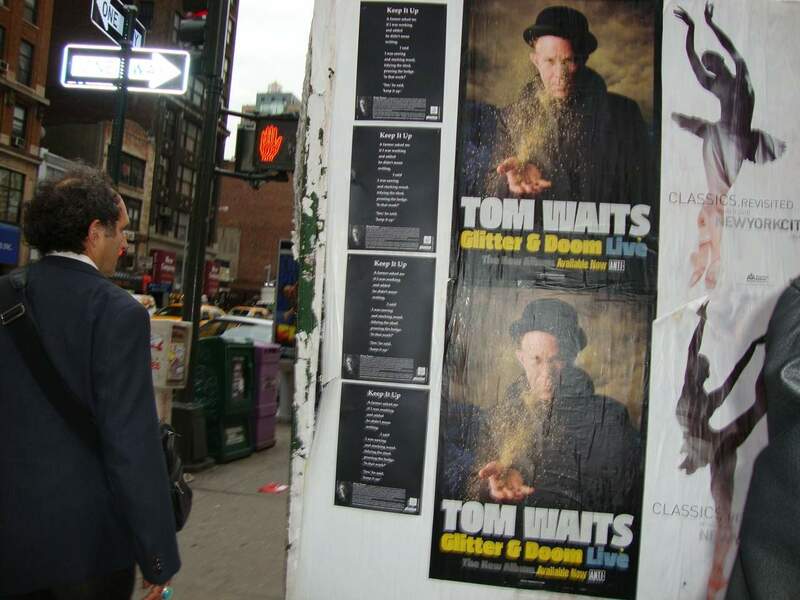 On this poster run I was carrying posters by several New Zealand poets. I always feel some kind of dignity as I go about stapling and cello taping (Sydney, Australia poster style) these posters to lamp-posts. There’s nothing so human in life as to be putting up poetry posters and (I’ve said this before) people do relate. 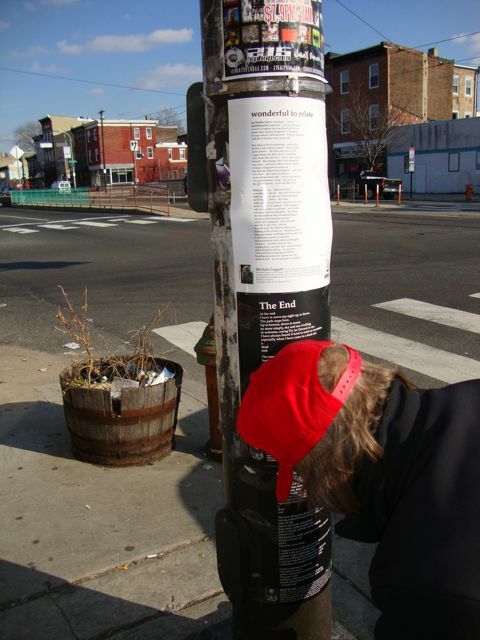 When you’re putting a Janet Frame Poem poster on a lamp-post in “The City of Brotherly Love” (Philadelphia) then you will connect to people, you will make ‘contact’ beyond superficialities. Janet Frame does that to people and God Bless her. Janet Frame touches people. That is a true blessing. All of our New Zealand poets touch people. I have some kind of awakening on this run as I watched a bloke go through Michele Leggott’s fine poem “Wonderful to Relate” line by line. This guy was really following what the poem was saying and I just knew it had changed his day. So I now know we can put more ‘content’ into these poetry posters. People will stop and read. There’s something human about all this. Who could not understand a poem poster on a lamp-post? Aaaah Philadelphia; the city of freedom. This is where Lenny Bruce was arrested in September of 1961. I always think of that each time I visit the city. Lenny was arrested on narcotics charges at the John Bartram Hotel on Broad Street. Lenny took the rap for us all. Lenny stood up and said things that challenged conventional norms. These conventional norms were giving us all heartbreak and Lenny broke through that. He exposed so much hypocrisy that there should be statues for him everywhere. I think everyone knows how life runs and it’s not how the authorities tell us life runs. Lenny talked about what was really happening and this frightened people – mainly the authorities. Lenny must have gotten hurt as all the criticism and arrests came in. There is no doubt we would not have the society we have now were it not for people like Lenny Bruce. He was a true poet. I take my hat off to him. In that year (1961) and the following year, Lenny was arrested several more times for saying words that most decent people say to themselves and carefully selected others. What was it Bob Dylan said? “Lenny Bruce is dead, but his spirit lives on and on…” I’ll say. I went mucking about in old Philadelphia putting up my poetry posters one by one and I just knew I was helping make a difference. That’s got to be the very best feeling in the world. When I finished, I felt really good. I turned around and saw people reading New Zealand poetry. That’s such a good feeling. This poster run happened on Waitangi Day weekend. The Phantom crew did the run on the Sunday morning in temperatures of 18 degrees Fahrenheit (32 is freezing). We carried posters by Jay Clarkson, Sandra Bell, Michele Leggott, Janet Frame and others. I always try to have a Janet Frame poetry poster nearby. We attracted lots of good attention and made some strong contacts within the Baltimore poetry scene. 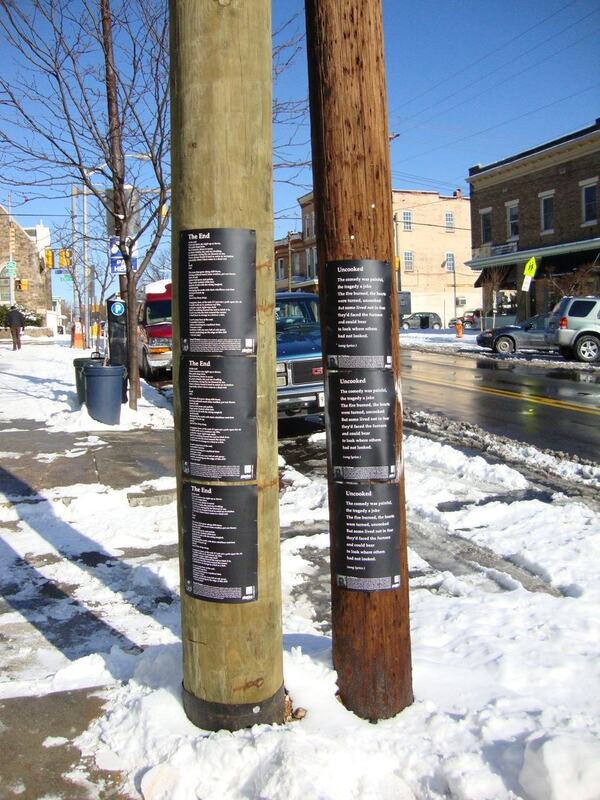 Nothing seems to break the ice like putting up poetry posters. People always seem to relate to a poem. Discussion always opens up. Baltimore, Maryland is a very creative city. It seems to be just bursting at the seams with artistic activity. To my mind, this is because the city is very nicely worn in and not completely taken over by shopping malls and franchise store operations. The city has a very bohemian feel (this feeling seems to have always been good for poetry) and this encourages people, young and old, to ‘have a go.’ It’s like the texture of the city gives people permission to move in creative ways. Shop rentals are probably quite reasonable in Baltimore and there is a great independent bookstore called Atomic Books. Atomic Books has a wide selection of fanzines that are put out by enthusiastic people from throughout the USA. They break the format of the publishing houses in exciting ways. But everyone seems to know Baltimore these days because of the TV show “The Wire.” This show has captured attention spans throughout the world as being a true story of what can go wrong within cities. We have the same kind of thing happening within New Zealand cities. It is a cruel and vicious set-up full of hurt, hypocrisy and dismay. Alan Duff writes about it so well. In time out of mind, H.L. Mencken lived and worked in ‘Charm City’ and worked for The Baltimore Sun. Here was another who saw what was going on in society and chose to write about it rather than turning away. The notion of “Not Turning Away” is a Buddhist concept. But what I saw in Charm City that really knocked me out was a Presidential motorcade. Barack Obama was in the city on the Friday, talking to local business owners. Local business owners (not the banks) are the engine room of the economy, we all know this. For Mr Obama’s splendid motorcade they had closed off one side of the I-95 which is the interstate into Baltimore. We were travelling the other way. The first thing we knew, here comes twenty motorcycle cops riding two abreast. A hundred yards back there are the first of twenty black Chevrolet Suburban vans carrying aides and secret service men, no doubt. It is all a very regal and disciplined scenario. Next comes five or ten black limousines, these are probably Cadillacs or Lincolns with extra sheets of steel built into their body shells. They are each flying the Stars and Stripes from the front guards. After that, we have more Chevy Suburbans and a fire truck and an ambulance. At the end are more motorcycle cops and there are a couple of helicopters (‘Marine One’ – the Presidential chopper) in the air. It all reminded me of seeing Queen Elizabeth II in Stuart Street, Dunedin many years ago. When I first heard that song, I knew I had to go and I’m extremely glad I did. This small poster run of about fifty posters happened after a Phantom Billstickers delegation met with the good people from the Poetry Society of America. From memory, most of the posters were of Brian Turner’s fine poem “Keep it Up.” I just found it good fun to be out with a staple gun. Manhattan, New York City, what do we know of it? Two members of “Bailter Space” live in Manhattan. Bailter Space is New Zealand’s finest band of its genre and I really don’t know if there is another band anywhere that fits into that genre. Bailter Space created it and did it so well. Of course, many fine writers and artists of all types came from or lived in New York City. New York City is where artists gravitate to and it lifts them up. There are too many names to list. I think everyone knows that this is a very creative town. It gave us the Ramones, Delmore Schwarz, William Burroughs, Patti Smith, Bob Dylan, Jean-Michel Basquiat, and Andy Warhol. But if you really got into a list, then it would never stop. There’s just something about the place. It is just so compelling.